Forget car washes or slinging candy bars. The National Ability Center is a nonprofit rec center that allows people of all abilities to participate in outdoor sports activities. With year-round programming, they know well that it takes more than a few trays of lemon bars to get them through the year. So instead, they, like many other organizations, have started to get creative with a balanced attack that includes the hottest prospect in the sports fundraising lineup: crowdfunding. As the trend has turned into a commonly accepted practice, tech providers are moving to meet that demand. SportsEngine, for example, has made crowdfunding functionality standard-issue on every website it hosts thanks to the recent acquisition of and integration with RallyMe. "In the past, we've had clubs raise money by creating special online registration sessions to collect donations, " says Rob Bedeaux, SportsEngine product marketing manager. "But now, not only are those crowdfunding capabilities built into their website via the RallyMe integration, we've given them a template to guide them towards a more compelling story – one that speaks to their brand and their mission." 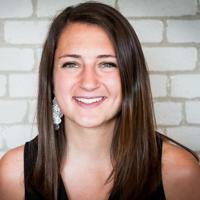 RallyMe, has taken online crowdfunding for athletics by storm. With average contributions being 66 percent higher than contributors to general interest online fundraising sites, a lot of organizations have used RallyMe to post an initiative online complete with a compelling story, rewards for various donation levels, funding goals, deadline and a running tally of donations. Donors are then able to lend their support by making a quick and secure online donation and sharing the campaign with like-minded folks. Because this online-driven model bypasses the limitations of traditional fundraisers – minimal reach, overhead costs, resistance from families to buy and sell items – it’s hardly a coincidence that its popularity for sports organizations has exploded right alongside programming and participation costs. 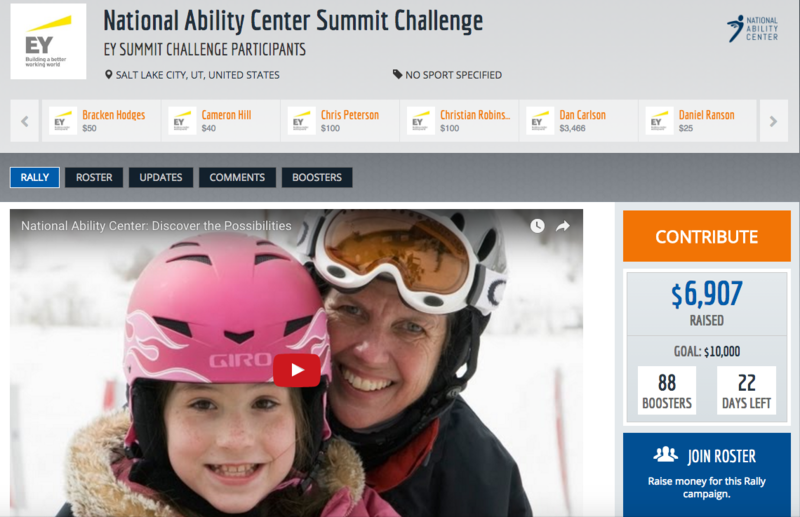 A crowdfunding hub for the National Ability Center Summit Challenge, on RallyMe. The National Ability Center has leveraged crowdfunding through major events it runs throughout the year. One such event is the Summit Challenge, a fully supported road ride through the mountains and valleys of Summit and Wasatch counties in Utah. This year marked the ninth annual Summit Challenge, with more than 900 athletes participating. 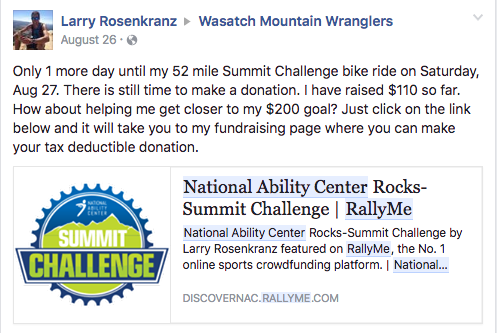 Unique to bike races, there wasn’t an entrance fee to ride, just a big push to donate and “share” the Rally, or for donors to create a personal Rally as a subset of National Ability Center-Summit Challenge Rally. Crowdfunding may embody the idea of “many hands make light work.” But in order to involve many “hands” you can't just build a fundraiser and then sit back and wait for the whole thing to go viral on its own. Promotions via social media posts and email blasts are necessary to spread the word and get people involved in your initiative. For the Summit Challenge Rally, the National Ability Center put in plenty of effort promoting all of its fundraising efforts, gaining the most traction it could to reach its goals. By the end of the crowdfunding effort, there had been nearly $47,000 raised from 407 contributors, money that will go toward the National Ability Center's advanced programming. Click here for more information on how our partnership with RallyMe can benefit your org.